February 1 will always hold a special place in my heart. One year ago today, I took a giant leap into the unknown when I quit my safe and comfortable 9-5 job and officially started my business. For the past 12 months, I’ve documented every step of the journey in my Becoming CEO series. 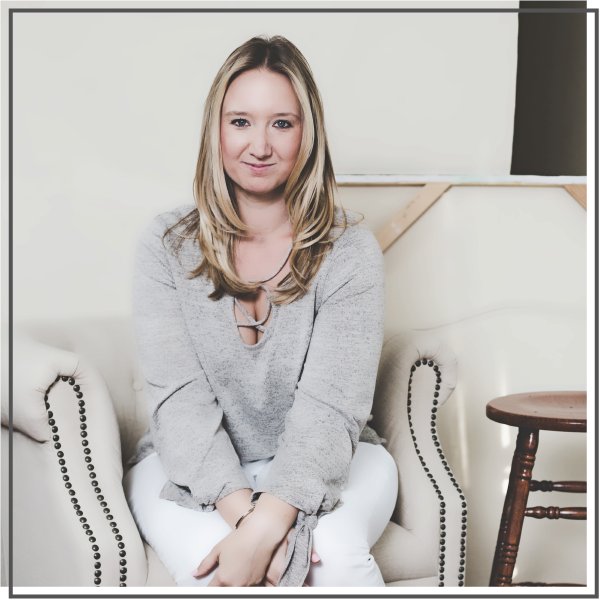 From detailing exactly how I started my business to opening up about my fears and anxieties to transparently sharing monthly income reports, nothing was off the table. 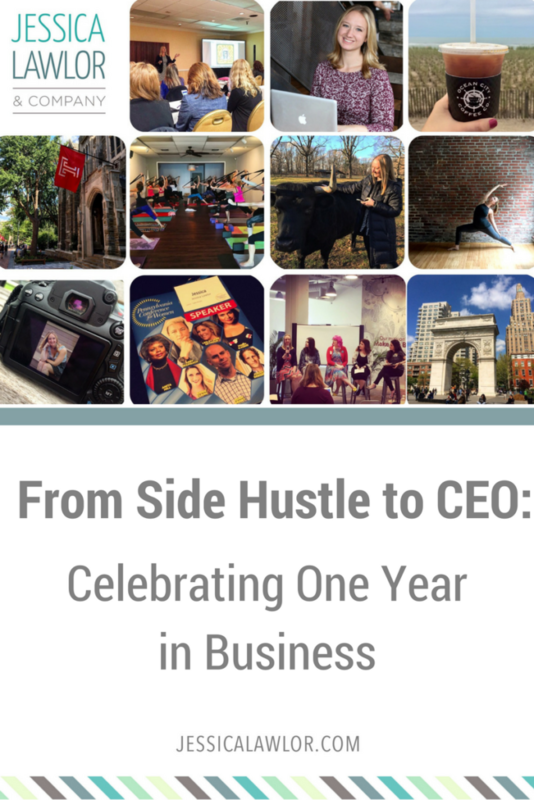 Want all the juicy details about my first year in business? Here’s an in-depth look at year one: lessons learned, the highs and lows, and a look at my big goals for year two. Here’s an income breakdown of how exactly I made money during my first full year in business. This graph details which areas of my business made up the most income over the past 12 months. Clearly, content management emerged as my strongest offering throughout the year. This is the work I’m doing with clients to run/manage THEIR blogs/editorial initiatives: developing editorial calendars, brainstorming article ideas, hiring writers, editing/laying out blog posts and sharing content on social media. I absolutely LOVE this work, and hope to do much more of it in year two. PR and social media came in second place here, no surprise. I worked in the PR industry for six years prior to starting my business, so I knew this would be an area I’d like to continue to explore. I love keeping my toes in the media relations waters, and staying up-to-date with this ever-changing industry. Big surprise! Teaching yoga turned out to be my third highest form of income! I always thought of yoga as my “fun job” and my new side hustle, but it’s actually brought in a nice chunk of change, and it allows me to live out one of my passions. 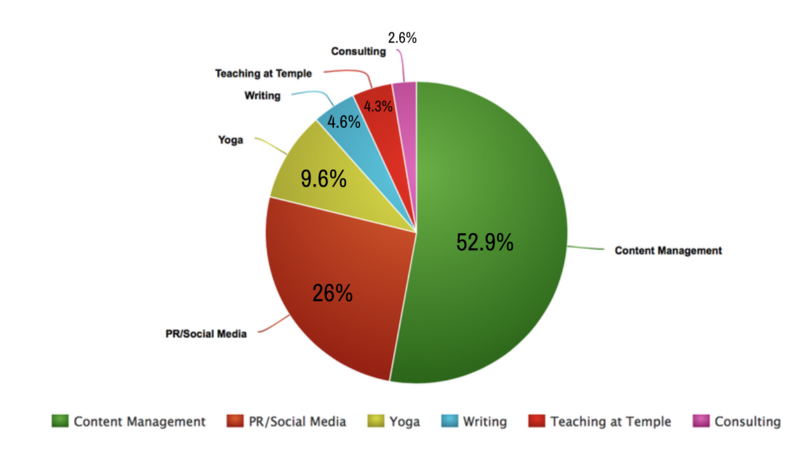 Freelance writing made up 4.6 percent of my income for the year. I did a lot of writing in the first half of the year, but focused my efforts and energy on landing bigger, long-term clients in the second half of my first year in business. I love writing, and want to continue to do it, but it’s not as profitable (most blogs/publications pay between $75-$200 for a post/article), so it has served me better to spend my time growing other areas of my business. If you had told me last February that teaching a college course at Temple University would make up part of my income, I wouldn’t have believed you. This surprise opportunity popped up at the last minute, and I’m so happy I was able to make this part of my first year as a CEO. Consulting (one-on one sessions with individuals on a short-term basis) is a small part of what I do, but it’s something I enjoy and would love to do more of this coming year. That’s why I launched Personal Branding Bootcamp and Pick My Brain Consulting. These offerings allow fellow solopreneurs and individuals the chance to collaborate without needing to hire me on a retainer or month to month basis. 1. Go with your gut. As a business owner, you make so many small and big decisions on a daily basis. It can feel paralyzing. I definitely struggled with decision paralysis throughout the year whether the decision was about a client project or something as major as selecting my business name and logo. I tried to trust my instincts. For example, as soon as I said the words “Jessica Lawlor & Company” out loud, I knew it was the right fit. I felt it in my body. Similarly, I knew when it wasn’t a good idea to work with certain potential clients. I often felt resistance within myself, and that was usually a tell-tale sign to stay away. 2. Take on less clients overall, but seek out higher-quality, higher paying relationships. In my first few months of business, I seriously considered *almost* every potential project that came into my inbox. Naturally, I was worried about having enough work and making ends meet, so I wanted to say yes to everything. I quickly realized it wasn’t realistic to try to satisfy 10-15 clients a month. I felt like my energy was scattered all over the place. Now, I’m working smarter. Instead of chasing lots of smaller projects and clients, I’m focused on 3-4 bigger (and therefore, higher-paying) clients that need more of my time and services. Yes, this can also be scary because if one client drops off (as happened to me this year! ), that’s potentially a big chunk of income to lose, but I have to trust that when that eventually happens, I will find a new project to fill that space. 3. Enlist professionals to be part of your extended team. Man, I wish I did. I thought I was doing everything properly when I started my business, but it would have been smart for me to hire an accountant right from the get-go instead of trying to figure everything out on my own. Throughout the year, I worked with other professionals, too, including designers, web/tech specialists and someone to help me through the LLC process. Similarly, join groups that help you grow. I joined the amazing Solo PR Pro group in August and have been constantly amazed at this incredible resource and supportive network of fellow business owners. I’m also a proud member of One Woman Shop, a group for female solo biz owners. These groups help keep me sane and allow me the chance to network with folks experiencing the same things I am. 4. You can’t do it alone. Similar to the above, why oh why did I wait so long to accept help? I never really understood all the hype about building a team. After all, I considered myself a solopreneur, solo being the key word. However, after half a year of running a business completely on my own, I realized something: I was drowning. And I needed help. Fast. So, I hired my first team member, and guess what? My business has thrived even more since bringing her on! Two minds are always better than one, and she brings new strengths to the table to make JL&Co even better. I hope to bring on more team members in year two! 5. Allow yourself to enjoy the freedom you create for yourself. Part of the reason I wanted to start my own business was for the schedule flexibility and the opportunity to be location independent. I got my first taste of location independence in July when I spent the majority of the month working from Ocean City, New Jersey. I switched my daily routine a bit and worked almost exclusively from 7 a.m. until 1 p.m. each day and then spent the afternoons at the beach. It wasn’t necessarily easy and I did miss having some semblance of a normal routine, but overall, I was excited to see that it’s totally possible for me to truly work from anywhere I have an internet connection. 6. Fake it ’til you make it. There’s no definitive guidebook to running your own business. Every day, I face new challenges. There’s absolutely nothing wrong with not knowing everything; we’re all works in progress. However, I learned this year that confidence is key, and sometimes you need to fake it ’til you make it. I learned to stand strong in my values, in my worth and in my work. As a CEO, you have many difficult conversations, and I’m still learning every day how to approach these exchanges with confidence and poise. 7. Treat yourself like a client. This is a lesson I know every fellow business owner can relate to. When I quit my job, I thought I’d have endless time to work on my blog and solo projects. Little did I know I’d become so bogged down with client work that my own projects went straight to the backburner. This isn’t okay! I need to treat myself and my projects (this blog, creating courses, ebooks, etc.) like I would one of my clients, so I can continue to grow my brand and attract new business. I realized this year how important it is for me to have a personal project to work on that relates to my own blog/brand, not just client work. It keeps me excited and energized. 8.You can’t please everyone. Ah, the typical struggle of a Type A business owner. I want to make everyone happy: my clients, my family, my friends, my students, the list goes on. This year, I constantly felt like I wasn’t doing enough to make everyone happy. If I was rocking it with my clients, time with my friends and family decreased. If I was out and about with my friends, I felt like I should be focused on my business. I had a constant feeling of “not enough”, but I know this is something I need to let go of. Similarly, I learned the difficult lesson that at the same time I can’t make everyone happy, not everyone in my life is going to be happy for me. When I made some big changes in my life and business, I noticed that I lost a few friends and connections who perhaps didn’t like the direction I was growing in. I’m trying to learn to be okay with this, too. 9. Protect your time. As a solo business owner, you make money through your time, expertise and energy. In the beginning of year one, I spent hours networking. There’s nothing wrong with this, but I quickly realized that I left little time to do actual work! After a few weeks of constant meetings and phone calls, I implemented a “no morning meetings” rule. I now keep my morning hours free for client work and schedule meetings/calls for the afternoon when I have less creative energy. It’s easy to let other people dictate your schedule if you aren’t strict with your time, that’s for sure. 10. When you create space in your life, you open yourself up to new opportunities. I was super nervous about quitting my job to start my own business because I thought there were a limited amount of opportunities out there. I worried that I wouldn’t find enough work. However, as soon as I cleared space in my life (and 50+ hours a week in my schedule), new opportunities seemed to pop up, in abundance. It’s true; when you create some space in your life, it’s like the universe knows that you’re ready and open for something new. So many amazing things happened this past year, many of them, opportunities I never even dreamed of. Let’s take a look at the highlights. I spoke at several events throughout the year, including the Pennsylvania Conference for Women, Florida PR Association, The Blog Connect Conference and the Temple PRSSA Invitational. I taught my first yoga workshop, Yoga for Teens. In addition to landing new clients throughout the year, I increased business with clients already in place from my side hustle, including my longest-standing client whom I love working with, Muck Rack. I landed my dream client, The Write Life. I launched Personal Branding Bootcamp and Pick My Brain Consulting, two different offerings for those looking for one-on-one time with me. I experienced my first $10,000 month in business, a huge financial milestone; this definitely isn’t the norm, but I hope to one day get there! I increased my yoga teaching, adding on two new studios, bringing me up to a total of five classes per week. I became location independent and worked from my happy place, OCNJ, during the month of July. I lived out my dream job when I became an adjunct instructor at Temple University, teaching in the Strategic Communication department. I’m building a team! No longer am I a solopreneur. This year, I hired my first team member. I officially became an LLC and chose my business name, Jessica Lawlor & Company (JL&Co). Let’s be real. Running a business is NOT easy, and there were dozens of less-than perfect days. Here are just some of the lows from my year. In the middle of the year, I parted ways with my biggest client. It was a major financial hit, but I know it’s going to be better in the long run. Taxes! I should have talked to an accountant from day one. I’m back on track now, but I made some mistakes throughout the year that could have been caught way earlier. I struggled with getting myself on a schedule/routine. It’s wonderful being able to make your own schedule, but it’s also a challenge! I used to pride myself on being an early bird, but once I didn’t have “anywhere to be” by a certain time, I struggled with waking up earlier, which led to a general feeling of laziness, even though I had more hours available to work. ANXIETY. I’m sure this is normal and something every business owner experiences, but man, the anxiety is real. Even now, I wake up some mornings completely freaking out, wondering things like, “Am I making the right decisions?”, “Am I doing enough?”, “How can I land more clients?” The worries never go away. Throughout the year, I experienced a general feeling of “Oh man, am I letting people down?” when I feel like I can’t respond quickly enough or do everything that I want to do. I hate that I can’t make everyone happy, but I’m trying to come to grips with this reality. I was super excited to launch my first personal project in the first half of the year, but the Personal Branding Bootcamp launch was a bit of a dud, unfortunately. Live and learn! We sadly had to put down my two year old kitten on a day when I had a TON of work and client deadlines. It was a serious struggle to grieve through that week and still try to get work done. Do much more public speaking! I’ve already booked a few speaking engagements and would love to add even more to my calendar. Launch a major product: Pick My Brain ebook/course (details and how YOU can get involved here). Bring on at least one more major client, ideally falling within the realm of content management. Try to write more. I miss writing here on the blog, as well as more creative writing. Re-develop my marketing materials. Now that I’ve officially named my company, I need to get new business cards, redesign my proposal deck and update my social media to reflect my brand. A possible website redesign? Eeeks. Not sure I want to think about this one just yet, but it’s on my radar. Hire an additional team member! Can you help me achieve any of these goals? Let’s chat! I’d love to work together. This is the end of my #BecomingCEO story, but it’s just the beginning of my journey. Moving forward into year two of my business, I’ll share quarterly income reports, but I’ll pop in between those posts with other articles about solopreneurship, running a business, productivity and more. I’m excited to continue openly and transparently sharing my CEO story with you! Thank you for joining me on this journey! Your support and love mean the world.